At this point of time in the evolution of Kuchipudi, one doesn't suppose Lahiri has had to make such a careful choice of gestures, postures and expressions. Yet one notices a certain aesthetic control being exercised over them, thanks perhaps to the training she has received in Bharatanatyam from Leela Samson. Thanks to Shanta Gokhale for the above statement as I feel her comment makes it easy to communicate to the readers about Amrita Lahiri and her Kuchipudi - evolution. Evolution is a continuous and accumulating process and it gives an apt context to this interaction with Amrita. Classical dancers like Amrita Lahiri bring in their performance a fresh perspective about creativity and reinforce faith and belief about the conventional knowledge and wisdom in the potential of the dance forms, Kuchipudi to be more specific. Here’s the follow up of Shanta Gokhale’s review about Amrita’s performance. Fortunately, the control does no harm to Lahiri's spontaneity, expressed in her darting eyes and lively smile. All the items that she danced, choreographed by her present guru Jaikishore Mosalikanti, combined complex footwork, clean lines, an unflagging pace and infinite grace. Her leaps and jumps were executed with the lightness of a gazelle; and one of the more awesome moments in the choreography was when the movement of her body exactly matched the meend of the bol "dheem." Kuchipudi is a living and enriching dance that grows and adapts to the times without losing its fundamental and essential character. The very essence of how Kuchipudi is evolving and reaching and like a banyan tree spreading to find dancers like Amrita Lahiri is very inspiring. This conversation with her will help understand more about her and her beautiful dance. What prompted you to start learning classical dance, where and how? Also, please provide a brief introduction to your wonderful gurus and how you felt learning from them. I started dancing when I was 6 years old in USA. I learnt from Anuradha Nehru for 10 years, until I did my arangetram at the age of 16 in New Delhi. I think any young girl who sees her feels inspired- she's beautiful, sophisticated, and gentle. Anuradha Nehru gave me the best possible foundational training any Kuchipudi dancer can get. It is amazing that even today technically brilliant Kuchipudi dancers are being produced in her academy Kuchipudi Kalanidhi in USA, on par with the best from India. She was uncompromising in her effort at bringing perfection in our steps. One has to be very lucky to have a good teacher like this in the beginning to give you a strong foundation of dance vocabulary. It is something that stays with you all your life. I've studied under Swapnasundari for a short time for 2 years, but I felt that my horizons stretched so much under her tutelage. She is one of the most outstanding creative dancers, admired for her abhinaya and research. Spending time with her was really a valuable gift and I cherish that time of learning. Currently, I train under Jaikishore Mosalikanti, who is an extremely supportive and talented, open minded Kuchipudi artist. Of course the most fundamental and powerful encouragement comes from my family! When I moved to Chennai in 2006, I sought out Jaikishore Mosalikanti because I had heard of his new choreographies and great nattuvangam. Only once we began classes, I realised what an amazing and caring teacher he is as well. He conducts my performances with his nattuvangam, and that has been a great source of strength. I have of course learnt a lot of his beautiful choreographies, but also spent a lot of time understanding talam, Kuchipudi compositions and music. Leela Samson, my Bharatanatyam guru, has also encouraged me and been a strong role model for her many students. She encourages us not simply to dance Bharatanatyam, but to be innovative, thoughtful and refined in anything we do. Your gurus are illustrious and rich contributors to the art form. As someone performing more of Kuchipudi, what according to you appeals the most to you personally about Kuchipudi? Kuchipudi is well-known for the lilt of the rhythm, the flow of the movements, the story telling dramatic elements. What attracts me most is the unlimited potential that this form has. Compared to Bharatanatyam and Odissi, Kuchipudi artists are not so prolific with new work that is rooted in the tradition, but that also appeals to a contemporary urban audience. For a dance form to survive, its practitioners have to innovate and expand the repertoire, and perform in ways that bring the essence of the art form to today's audience. It has to be rooted in history yet attractive NOW. This potential is what is most exciting. Yes, I think Kuchipudi has enormous potential. You have performed extensively. I mean globally. How is it performing Kuchipidi in the West and in other parts of India, (away from the tiny village and from the state where Kuchipudi is)? What are your observations about the receptivity of the divergent set of audience and how did it appeal to the diverse audience? My most memorable performance was in Museum Reitberg in Zurich, Switzerland. It is incredible how the audience in Europe is sensitive and receptive to our dance. They have a refinement, an inherent respect for art, some understanding of philosophy and poetry, which are essential for appreciating classical dance and music. In India we take our culture for granted because we are constantly surrounded by it. We also have an unfortunate and outdated inferiority complex - imitating the West in food, dress, dance, and music. Many of my friends in Bombay have no interest in classical dance and very little respect for it. I understand where they are coming from; they were not taught what to appreciate in these arts from a younger age and cannot understand the value of it. There is something missing in our education system and that is why I feel audiences in Europe and USA are sometimes more receptive than those in India! You have to approach these arts with an open mind and heart. Also, presenters have a responsibility. In most European theatres and the big American ones, they take a lot of time and energy to present only the best. In India, too many people have seen boring, uninspiring dance performances and that becomes their impression of dance. Instead, if presenters were to make festivals that are dynamic, youthful and vibrant, being careful of what quality is presented and how it is packaged, perhaps we would see a little more enthusiasm in India about classical dance too. Continuing the underlining “potential and appeal,” what do you think of Kuchipudi repertoire? We have some very popular traditional items as well as some recent popular items. What are the items that you personally like to perform, their relevance in these changing times? I love performing the solo version of Usha Parinayam that Swapnasundari taught me. I have been dancing this at most programs for almost ten years! I also love to perform Kishore Mosalikanti’s tarangams - the audience always responds to it. Guru Vempati Chinna Satyam's choreographies are of course a favorite and seen often performed by many dancers, so I usually don't include too many of these in my shows, though I enjoy dancing them. I have created a thillana in Raag Desh with Tagore’s sahityam which is also a favourite. While on the subject of the choreographic works, agreed that Kuchipudi has enormous scope. But then relatively speaking we just have a few good items choreographed in the recent times that adhere to some standard. What is to be done to have more good choreographies so that they can be performed by many Kuchipudi dancers? A choreography will become popular and stand the test of time only if it has depth. Simply putting pretty Kuchipudi steps to a song is not going to produce an item that dancers want to perform nor that audiences want to see. I can perform Usha over and over again because it is firstly, rooted in the Kuchipudi tradition, and then because it has been adapted in a way that suits modern audiences and dancers. The piece has depth - of emotions, music, technique. Only pieces like this can survive. 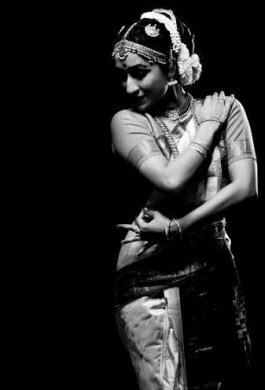 A piece created with research, intelligence and talent with a bit of luck, can expand the Kuchipudi repertoire. “Test of time” is indeed a good indicator and measure. To know more about your thinking on this… how far are the traditions and classical aspects going to survive the test of time? What specific elements need to be preserved and continued? Every art form evolves and this is vital for its continuation. Surely Kuchipudi will not just survive, it will flourish in the future. But for it to retain vibrancy, we need more artists from diverse backgrounds to take up the form as serious practitioners, and to keep adding to the repertoire. We need more dancers with clarity of thought and technique, also an understanding of how to engage various kinds of audiences. If there are many artists, then we will see diverse interpretations of the form. Each artist picks up different nuances from their gurus, each discovers a new approach to the dance form. It is no longer limited to the specific Brahmin families of Andhra whose boys used to dance. Of course those families are the most important in the story of Kuchipudi, and we need their knowledge over generations to keep in touch with the roots of the dance form. Kuchipudi artists and all artists in fact, can stand the test of time only if they keep in mind the changing context of their art form. Keeping in mind the changing context of the art form in this evolutionary process, what do you think of one specific transition that we have already witnessed, that is, moving away from the traditional Guru Parampara? What measures are needed to preserve the fundamental orientation of Kuchipudi and the original knowledge, at the same time to retain the flexibility to have innovativeness and creativity intact? Students will pursue Kuchipudi with as much seriousness as the teacher. If the teacher is uncompromising in technique, rigorous in his/her understanding of the theory, music, talam and composition of the pieces, the students will surely feel encouraged to learn. The approach to teaching is important. We are not trying to teach youngsters simply to perform beautiful steps. We need to teach them how to find the creative potential in any dance form. Only then can they devote a lifetime to appreciating or expanding the art. We have to show them the ocean of possibilities that exists in Kuchipudi, not just a narrow pretty stream. Dance teachers must seek to create innovative artists, not simply beautiful dancers. Although we have lost the days of guru-shishya parampara, the best learning comes only from this kind of intensive interaction. Students must seek out knowledge, not be passive observers. You worked for Kalanidhi Dance. We in the dance community often hear expressions of awe about Kalanidhi from enthusiasts. What was your experience performing for them? It has been my privilege to have done a few performances with Kalanidhi- Anuradha Nehru's dance group - when I was in the United States. The dancers at Kalanidhi are of the highest quality, and extremely hard working. One rarely finds dance groups as well coordinated and aesthetically presented as Kalanidhi. It speaks of Anuradha aunty’s uncompromising pursuit of excellence, her deep influence as a guru to all those who study from her. You are one of the very few dancers that held a senior-administrative post in a renowned and reputed cultural institute, in NCPA. What have you learnt from the experience? I am sure your insights would be beneficial to the larger dance community as well. Those three years at NCPA were eye opening. I got re-affirmation of my belief in dance from my experience there. When I joined in 2010, there were only 2 or maximum 3 dance shows in a month, with very little audience for most of these. By the time I left, there were 5-7 dance events every month. In a city like Mumbai, where people don't have time or patience, there were 600 people watching a Kathakali performance for 2 hours at a stretch! It was simply the power of the dance, and careful promotion and publicity. We presented high quality without exception and that is what enthused audiences. They knew that if it was being staged at NCPA, it must be good, and so they came to watch. High quality and hard work always speak. Author's note: Amrita Lahiri represents a Kuchipudi dancer who is evolving and has the advantage of understanding diverse tastes of global audience. She has education and national and international exposure in various capacities. There is anticipation in dance enthusiasts and they look forward to her new works. Her recent performance under the guidance of Odissi guru Sharmila Biswas received appreciation from the dance community. My best wishes to a bright and sincere dancer.